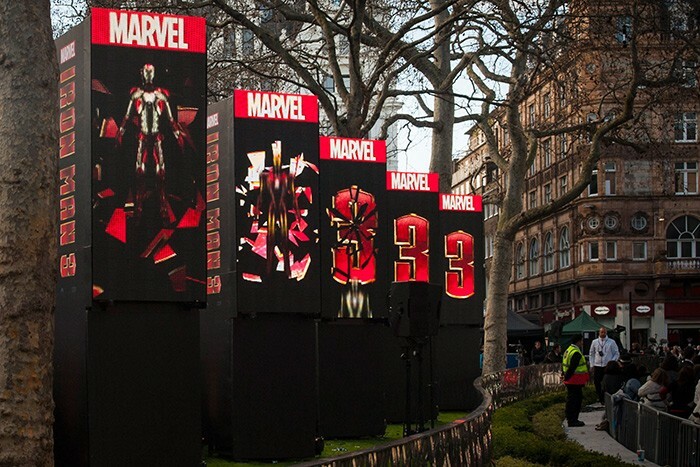 XL Events supplied LED screen for the UK premiere of Iron Man 3- the latest installment of the blockbuster Paramount Pictures and Marvel Enterprises franchise – at an event staged in London’s Leicester Square. To display logos and character images from the movie, the design called for vertical LED "banners" which towered above the waiting crowds in the Square’s gardens. Each banner was 3 metres high and mounted on a 2 metre high plinth to ensure that the LED was visible from all around the cinema. XL Events supplied 147 tiles of Pixled FX-11 outdoor LED which was rigged in XL’s special 3x2 touring frames - allowing the LED tiles to be pre-cabled ahead of installation - saving valuable time on the day. Working in the gardens of Leicester Square proved challenging due to the soft ground in the grassy areas, which meant all the LED had to be manually lifted into place by XL’s technicians Graham Vinall, Rob Smith, Gary Burchett and Fabrizio di Lelio. The touring frames helped simplify the rig and ensured that the tiles were structurally safe once in their raised position. Content for the LED towers was stored on and played back from one of XL’s Catalyst media servers, programmed, managed and controlled by Nev Bull. 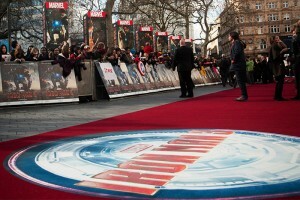 XL Events’ project manager Mark Rooney comments: "It was great working with the production team. Whilst the location provided some challenges, our crew worked tirelessly to ensure the LED was installed safely and the displayed content looked fabulous."